I grew up on Ohio farm style cooking- not fancy, but made with fresh ingredients and love by a wonderful cook, my Grandma Nelva, and Ive been cooking and baking for over 30 years. I remember watching Grandma cook and bake when I was a little girl. She made the best desserts of anyone I ever knew and shes still going strong at 89. When I go to visit her in Ohio she still makes me my favorite meal of homemade beef and noodles with mashed potatoes and coconut cream pie for dessert. Yummy! Now that Im older, it seems everybody is worried about their weight (including me), and I have a hard time making myself slow down on baking goodies! But, even with everyone being more health conscious, I started this site because a lot of people, including me, are nostalgic for a slower-paced time when these recipes were made everyday by someone's mom or grandma and, the kitchen was still the heart of the home. 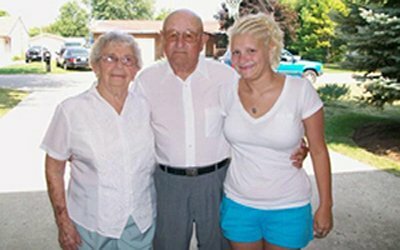 Grandma Nelva, Grandpa John and their great grandaughter Samantha Sparks.